Hello, it’s the Assistant Shop Manager. As we talked about in the previous article “Mountain Nutrition”, there are various benefits of being able to efficiently use stored fat cells as a source of energy. What do you have to do in order to be able to efficiently use the stored fat you have as energy when you are doing exercise? Depending on the foods that you eat everyday, in addition to the type/frequency of the exercise that you do, the ratio of nutrients that you are using for energy at rest/during exercise is different. Especially for ultra-marathons and long-time duration events, by the well balanced conversion of fats/sugars to energy during exercise, being able to maintain a steady level of high performance is in high demand. Also, even for short sprint-like high intensity activities, by increasing the predominance of fat metabolism, there is proof you can recover quickly and be able to maintain a high level of performance. –What happens when you are FAT ADAPTED ? ＊The accumulation of everyday is very important for ( FAT ADAPTATION). Increase the amount of the ratio of fat (MCTS) you are intaking each day and let’s check your balance of total intake of carbohydrates, protein and fats within your meals. 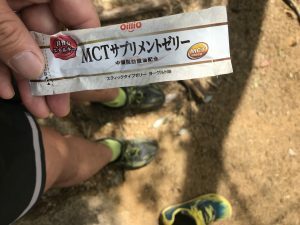 STRIDE LAB is recommending to take 1 pack of the NISSHIN OilliO MCT Supplement Jelly every morning. ＊By taking enough MCTS at breakfast, you can keep a high level of concentration in the morning and have enough energy to get through lunch. 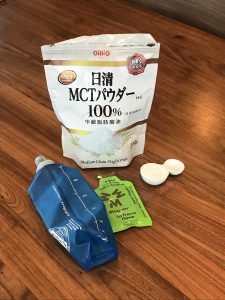 Also, even in the case of doing exercise, MCTS can be easily used as energy so they are said to be the all-purpose supplement. In your wallet, you have your debit card and a little bit of cash (sugars) but actually with having your card you can use any amount of money that you have in your bank account (fats) while at the same time using your cash /change (sugars) for immediate necessary use. How is the assistant shop manager taking these MCTS? ＊The assistant shop manager is consistently using this supplement to his liking. Depending on the people, some people it will be necessary to take in more energy than this whereas for others, by taking this much they will have an upset stomach so it is important to practice to use this supplement before a race. Next time we will be writing more specifically about how to go about being (Fat Adapted). We have lots of fat in our body (some more than others). Our bodies have the ability to burn fat for energy. If we can be efficient at burning fat for energy, we can be more efficient at doing long distance exercise.